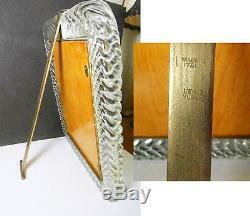 A gorgeous and rare large size signed Venini twisted glass picture frame. An original vintage Venini piece dating from the 1930's - 1940's era. 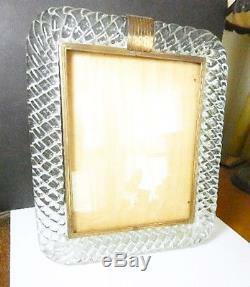 Measures approx 13 1/4" by 11 1/2" and holds a 10 x 12 picture. Very thick and heavy "twisted rope" glass with brass accents and stand. Stand is signed "Made in Italy" and "Venini, Murano". EXCELLENT original condition with no chips, cracks, or flakes. Brass shows some discoloring from age, I have not attempted to clean it. Appears to have original wood backing, one of the four clasps which holds back to frame is missing, very minor. The item "VENINI Murano Twisted Glass LARGE Picture Frame, Vintage, Signed" is in sale since Tuesday, December 12, 2017. This item is in the category "Pottery & Glass\Glass\Art Glass\Italian". The seller is "dannylin" and is located in Ridgewood, New Jersey. This item can be shipped to United States, Canada, United Kingdom, Denmark, Romania, Slovakia, Bulgaria, Czech republic, Finland, Hungary, Latvia, Lithuania, Malta, Estonia, Australia, Greece, Portugal, Cyprus, Slovenia, Japan, Sweden, South Korea, Belgium, France, Hong Kong, Ireland, Netherlands, Poland, Spain, Italy, Germany, Austria, Mexico, New Zealand, Singapore, Switzerland, Norway, Ukraine, Kuwait, Croatia, Brazil, Bermuda, Bolivia, Ecuador, Guernsey, Gibraltar, Iceland, Jersey, Cayman islands, Liechtenstein, Luxembourg, Monaco, Peru.